Disney’s latest real hit, “Frozen,” from 2013, has been called a masterpiece that is likely to usher in another Disney renaissance similar to that of the 80s and 90s. The music, the art, the beauty, the story, and the characters of this blockbuster have really changed the way that people are looking at animated movies. The value Frozen franchise has well surpassed 1 billion dollars already. 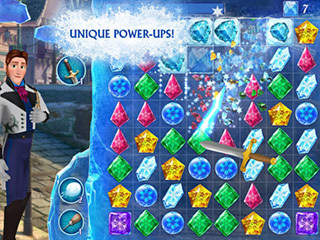 So, you already know that if Disney invests in a mobile app game based on the movie, Frozen, then the app had better well be worthy of the franchise name. Well, this one most certainly is! 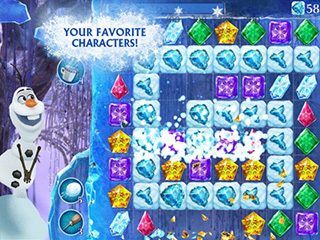 Frozen Free Fall is a hot new Match-3 game that lives up to the standard of Disney’s Frozen movie. As you would expect, there is lots of ice and the color, blue, involved. Blocks can be frozen in cute little blocks of ice and then unfrozen during the game play. When you line up the proper gems, they do this cool blowing up and shattering motion. Some levels will feature Olaf the snowman wearing a cute straw hat and partying with you under the sun. Don’t worry, though, he doesn’t melt! These puzzles are absolutely addictive, but with as many as there are, you won’t run out of puzzle supply any time soon. Download today! This is Frozen Free Fall review. Download this game here.